Well there we go the bridge to 4G. I welcome all information regarding T-mobile’s plans to enhance their network to a fourth generation offering, no matter if they only offer bread crumbs this Friday. Any indication in the direction they choose is a sign of life and continued effort to take T-mobile USA to the top. BTW, our invitation for this conference must have gotten lost in the mail, so hopefully somebody with a laptop or pen and paper will be covering this event so we can get all the facts on T-mobile’s keynote. Hi Dave: Well at least we have something to look forward to. Can’t wait for more info. If T-Mobile is able to hit the 250 Million POPS figure in 3G coverage by next year, how does that number compare to their current 2G footprint? Is that 80%, 90% or more penetration/overlay? Assuming that their 2G footprint is around the 260 Million POPS mark, that means that the majority of T-Mobile’s network will be 3G ready next year…. hopefully. Hopefully someone will ask real direct questions so we can get real definite answers surrounding their build outs. 1) During their Phase One 3G rollout, many sites were skipped leaving holes in 3G coverage. Will these holes be filled in with 3G panels? 2) Will all markets be 7.2 Mbps capable by the end of 2009 and do they have the necessary backhaul to support such speeds? 3) What equipment soon to be deployed will be HSPA + capable? 4) Any 3G roaming agreements in the works with domestic US operators to fill in the areas where they currently do not offer any coverage? 5) I’ve noticed that inside my home, my 3G signal defaults to EDGE…. just like AT&T. Any plans to offer 3G capable Femtocells to their current subscriber base to improve indoor reception and coverage? 6) What is T-Mobile’s plan for UMA going forward? Will it be abandoned for a Femtocell solution? Any new high end 3G phones that will support UMA? I’ll be interested in hearing what Ray has to say. I’ve been concerned for a while that at least one competitor would roll out 4G before T-Mo finished its 3G rollout. Danny also raises a number of good issues. The US is only patchily covered at present; how quickly will T-Mo fill in the gaps. Unfortunately, it’ll be hard to have roaming agreements as long as T-Mo is using AWS band instead of the 850 or 1900 mhz bands, just like it’s hard(er) to offer a wide variety of phones if you have to have AWS 3G. The signal issue is a big one. AT&T and Verizon sit on the longer-wavelength requency blocks that would make structure penetration more reliable. At 1700, 1900, 2100 mhz T-Mobile is always going to be handicapped on this. The Femtocell solution might be the best fix. As unfortunate and misleading as it is, T-Mobile needs to pimp the HSPA+ as “4G” or else the market will think T-Mobile is behind again. The speeds will be just as good as 4G and, as their marketing leads me to believe, it will work on all the current 3G phones, even the G1– it should be capable of these speeds (albeit at worse battery life than they already have). I LOVE THIS!!! Tired of Sprint saying 4G on their networks and having to explain to customers that it’s still in the process for other providers. Now T-Mobile is giving us some help on this front! LOVE the magenta! Bull hockey. TMo still doesn’t have 3G service in the top 25 metro areas of the US. I think it’s a little premature to be thinking 4G. 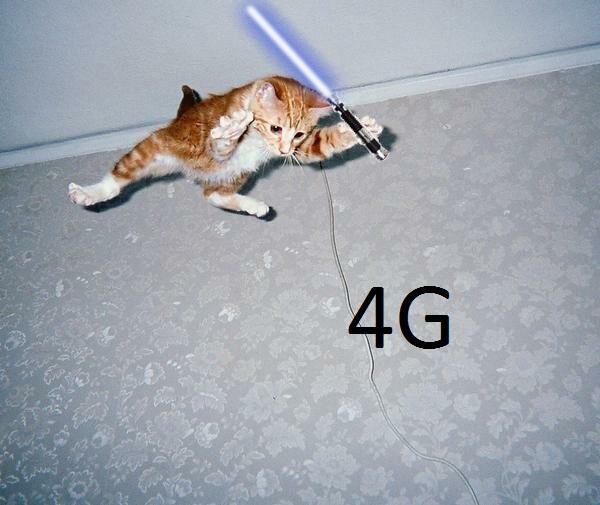 Get on the stick with the 3G rollout first, TMo! I totally agree with g_willi, t-mobile is no position to talk about 4G. They need to focus their efforts in catching up with 3G, which seems like it will take atleast 2 years. Their current 3G coverage is embarrasing compared to all the others and they should focus all their efforts in expanding this coverage. Then and only then can they seriously consider future technologies. I doubt 4G will be running on Tmobile before 2012. The wonderful blog will be recognized one day soon and then you will be invited to all Tmo related events. I’m rootin for ya. @ali and g_willi – Umm, have you not been paying attention? They’re rolling out 3g at a rate of a new city every 1.6 days. They’re VERY quickly catching up with ATT, and very well may have the entire network covered with 3g by early next year. As they finish blanketing their 2g network with 3g, they’ll be upgrading their 3g network speeds in the biggest cities to support HSPA+. The benefit of HSPA+ is it now provides TMO with the option of going ALL-IP. This would make the “bridge” to LTE very smooth. Why rush into LTE when HSPA+ gets you 3/4 of the way there in 6 months for 1/2 the price? LTE STILL doesn’t have a voice component. At this point, it’ll just be a new data network. With the HSPA+ upgrade path, TMO can get all their ducks in order, upgrade the backhauls, increase speeds to end users, all on the AWS band. They can get up to 42mbps eventually with HSPA+ alone. All the while, they could move to an all ip network, without jumping into all-ip LTE with both feet. Once LTE gets a voice component, and LTE phones have batteries that last more than 35 minutes, TMO can hop on board. LTE in 2010 or 2012 is jumping the gun. Hell, the Euros aren’t expecting LTE deployment until 2014. One problem that T-Mobile currently has in their 4G plans would be spectrum. There isn’t enough spectrum on AWS to run HSPA + and LTE. Assuming they are not counting on their own PCS band (after they move the legacy GSM users off of it), they may need to buy a company with a sizeable spectrum portfolio in order to accomplish this. Sprint anyone? As nauseating as a Sprint purchase sounds, I see no other way to get a national spectrum footprint. Buying the regionals like Metro or Leap may give them some spectrum in key markets, but not enough to blanket the nation. Unless the FCC plans another specrtum sale off soon I don’t see too many options for T-Mobile long term. They are under intense pressure to turn things around by mid next year or face a serious management shakeup by the shareholders. dumb question but what does pops stand for? To everyone saying that Tmo should finish their 3g network before starting on their 4g network, why can’t they do both. Isn’t that how Tmo fell behind the other carriers in the first place, not thinking ahead. Now they are making sure they don’t make the same mistake again. And for everyone not covered by 3g yet, stop complaining. Cincy and Salt lake are not major cities, more like really big towns. Maybe Tmo isn’t going by overall population, maybe they are going by subscriber numbers in the different markets as a deciding factor about city launch order. If the wait is as bad as some of u are making it out to be then I’m pretty sure there are other carriers that can meet your cellular needs and wants. The areas consisting of Cincinnati, Dayton and the space in between has full (T-mobile band) 3G right now. The only problem it’s on accessible through cincinnati bell for some odd reason. It’s the same 1700 band that T-mobile uses, so I’m not really sure T-mobile subscribers aren’t getting it… however I know it’s there..I have an unlocked G1 running 3G throughout said area on Cincinnati Bell. “POPS,” is an acronym that is used to represent the total POPULATION to which a specific wireless provider can offer service. For example: Say a wireless provider only covers the Greater Los Angeles, CA. area. It could be said that the provider provides coverage to nearly 10 million POPS since that’s the amount of people who reside here. POPS is only in reference to people or population not geography nor does it necessarily mean “quality.” That means they don’t guarantee to cover every knook and cranny of each region just the overall populated area(s). I watched the entire fireside chat with Cole Brodman and it sounded to me like they were definitely going with LTE. I think WiMax is the new Betamax. just got off the phone with cust svc today. Although 30014 might consider it to not be a major city… I was told in that the st. louis market would have 3g by beginning of Q3 (this is what cust svc told me in FEBRUARY). granted cust svc might be the last to know. The rep was not able to quote me a date for 3g whatsoever. He said a lot of the rollouts are a month behind so hopefully in a month. That’s just not gonna cut it for me. what good is a new bold gonna do me with no 3g? yes the rep was very nice and friendly, but c’mon tmo. i’m done with them. t-mobile has a deal with comcast to help with their 4g service and on my property comcast just finished hooking up their cable to the t-mobile tower outside and there are new boxes attached to the tower that say comcast. so hopefully 4g with be coming out soon.